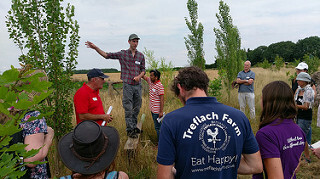 In July the AFINET UK Agroforestry Network arable and livestock groups met up at David Rose’s farm, Home Farm in Nottinghamshire. The meeting started with a tour of the Farm, over the last few years David Rose has established various agroforestry systems on his farm. With the help and support of the Woodland Trust he has planted over 11,000 trees on his farm. Systems include a silvoarable field with apples and cereal, as well as a newly established edible woodland which he is grazing with sheep. Discussion focused around the difficulties protecting trees from sheep in a cost-effective way. The drought conditions experienced in the UK this year also prompted discussion around the shade (and shelter) that the trees provide to livestock and the value of this is extreme weather conditions. There was also interest from the group in competition (for water) between the apples and the arable crop and the impact of the tree on crop yields. Tom Staton from Reading University described to the group the research that he is undertaking at David’s farm as part of his PhD looking at how silvoarable systems can be optimised to deliver ecosystem service benefits from biodiversity? We also heard from David about some of their farm diversification enterprises including a care farming initiative, café and workshop space. We then headed back inside to carry out the evaluation of the innovation list and to hear from Steve Newman from Biodiversity International who has a wealth of experience of agroforestry systems in the UK, whom we asked to contribute his knowledge of mature agroforestry systems. This provided a great introduction to the afternoons agroforestry design workshop led by Stephen Briggs from Abacus Agriculture. Stephen talked the group through the design process from choosing your site to planting your trees, we then split into smaller groups to look at maps and discuss design possibilities.